Birth 5 Oct 1683 Woburn, Middlesex Co., Mass. Father THOMAS CARTER, Jr., b. 8 Jun 1655, Woburn, Middlesex Co., Mass. Mother MARGERY/MARGARET WHITMORE, b. 9 Sep 1668, Cambridge, Middlesex Co., Mass. Family JOSHUA SAWYER, Jr., b. 20 Jun 1684, Woburn, Middlesex Co., Mass. Status: Located. 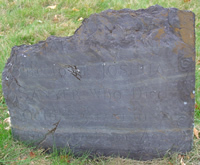 '...Mary Sawyer wife to Mr Joshua Sawyer who died Octobr 23d 1751 in ye 69 year of her age' The top of the stone is broken and missing. Her headstone reads '...Mary Sawyer wife to Mr Joshua Sawyer who died Octobr 23d 1751 in ye 69 year of her age' The top of the stone is broken and missing.